The Goby toothbrush + subscription, $65. Normally I'd caution you by saying that giving someone a toothbrush for Christmas may do more harm to your relationship (whether it be familial or romantic) than good. However, when I first heard about the Goby toothbrush—an affordable, super good-looking electric toothbrush with an optional subscription for brush head replacements—I immediately thought of like five people who would love it. The brush comes in four stylish colors and can go for weeks on a single charge (which makes it great for traveling, btw). Rather than causing the recipient to question their hygiene, they'll mostly be excited to try it and proud to display it next to the sink. Nomad leather charging wallet, $119. This is another one of those unique pieces that certainly isn't the right gift for everyone, but when I came across it I couldn't help thinking that it would make a great gift for anyone who travels a lot, or someone who is constantly out and about. Nomad makes a variety of charging accessories, but this folding wallet is my favorite, simply because it's so good-looking. Flights without power outlets, late nights at the bar, long meetings, you name it—there are a lot of places and situations when this would come in super handy. Pure Cycles Yoke single-gear bike, $349. Ebbets Field Flannels 'City Series' sweatshirt, $79. Along with personalized stuff, I think that localized gifts always tend to go over well. Does every guy in New York need a sweatshirt advertising that truth? No. But if, say, that guy's hometown is Seattle or Dallas or Caracas—Ebbets Field has a cool, vintage-feeling sweatshirt that he'd be proud to wear. Also, if you want to get ultra-local, check out Tuck Shop Trading for tons of beanies repping neighborhoods from Greenwich Village to Little Italy and Malibu, as well as a bunch of ski resorts and Canadian cities, too. Atlas Coffee Club subscription, $14 - $42 / month. Pod coffee is bad for the environment. Plus, it's only kind of good. Most men I know rather enjoy the process of making their own coffee in the morning, whether that's with a Chemex or a French press or a plain-old brewer. If he's already got the tools to make his favorite cup, why not hook him up with monthly coffee deliveries? Atlas Coffee Club will send him (ground or unground) beans from around the world that also happen to come in very aesthetically pleasing bags. Yeti 'Rambler' lowball vacuum-insulated cups, $20 each. You don't have to be an avid outdoors-person to get some serious use out of Yeti's lowball cups (with lids). These stainless steel ramblers keep cold drinks cold and hot drinks hot for hours. Yes, these are great for camping and picnics in the great outdoors... But how about a snowy walk through the West Village with a homemade bourbon and cider (arm-in-arm with your main squeeze, no doubt)? Or come summer, heavy pours of chilled rosé as you take in the sunset on your roof? You're feeling me now, huh? Get the set of four ($79) here. ZZ 4-in-1 Breakfast Maker, $35. Other fun and random things, $10 - $135. At this point in the holiday hustle, I've put so many gift guides together I could put like 100 things in every bundle. However, you don't come to blogs like mine to be overwhelmed with options. You want the best, and you want it to be smart and easy. Anyway, below I've rounded up a few more random gifts that I find to be fun and cool and mostly for guys (though that's really up to you). First—a dart board and darts. My last boyfriend had a dart board in his backyard and we spent one particularly amazing summer afternoon drinking Radler and playing darts in the fading sun. It's such a fun game and this board is just $45 (and ships for free from Nordstrom)! I also think this old school electronic basketball game makes for an awesome stocking stuffer, as does a shaving kit from Harry's. I've always been a believer that books make a great gift (duh), because there is a book out there about literally everything. For every person on your list, you could find a book that fits their personality to a tee. Always partying? Yep. Obsessed with Bill Murray? Indeed. Loves to cook and drink at the same time? Here ya go. Finally, I snuck in a few more wearables. The RAEN 'Remmy 52' sunglasses are a unisex and I think almost universally flattering frame, and the L.L. Bean fisherman sweater is the perfect "Here's this sweater for you, babe, but just know I'm going to borrow it all the time" gift. 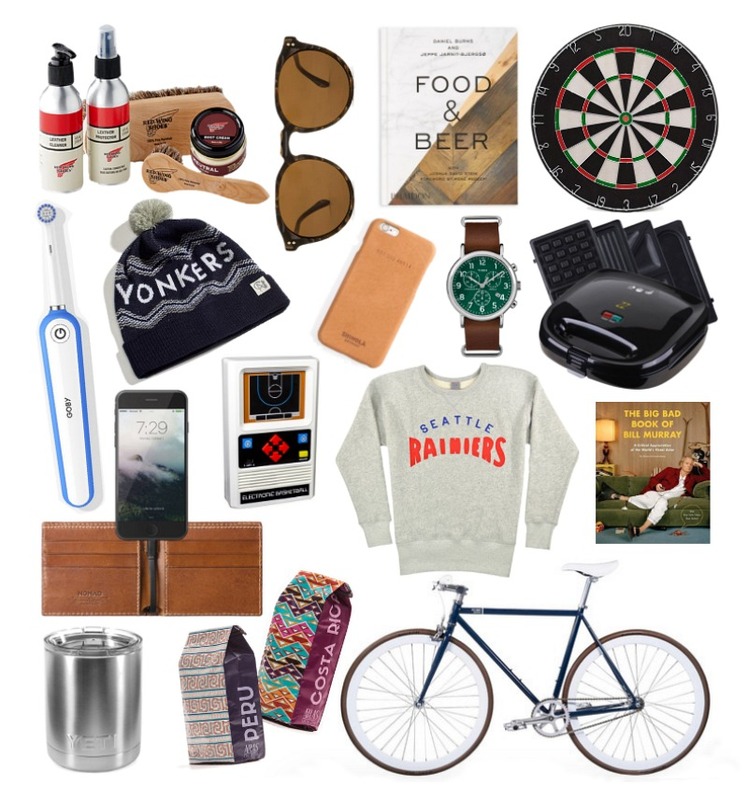 Shop 12 more gift ideas for guys below! All the gifts are truly amazing! I was looking for birthday ideas for boyfriend. Now I am going to pick up some gifts from the list. Thanks for the nudge!